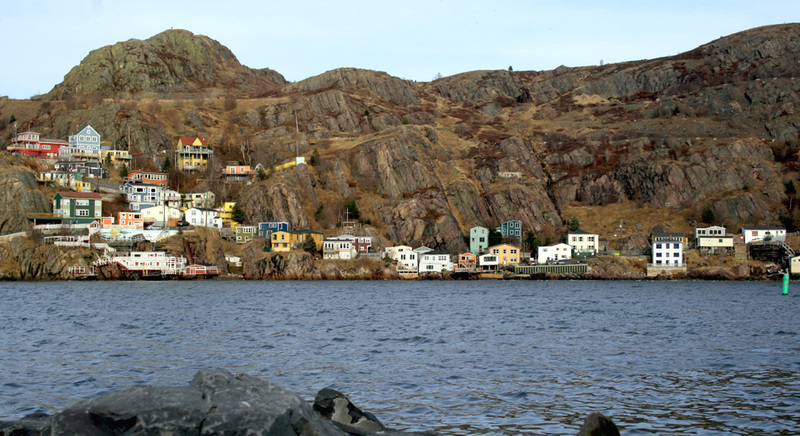 The St. John’s Christmas Bird Count (CBC) takes place on Boxing Day (December 26) every year; rain, snow or shine. This season’s count was met with relatively warm (above freezing) temperatures, early morning rain/fog, and then beautiful clear weather. It was stark contrast to last years which saw more than 50cm of standing snow on the ground and frigid temperatures! This was the 49th year for this particular count, and I’ve been taking part for the past six (ever since I got married and stopped spending the holidays in my hometown of Lewisporte). I look forward to every CBC that I’m able to participate in, but there is something special about this count … the dump! Each year I join my good friends Bruce Mactavish & Ken Knowles to cover the gull hotspots in east St. John’s – the local landfill (dump), Quidi Vidi Lake and the harbour. 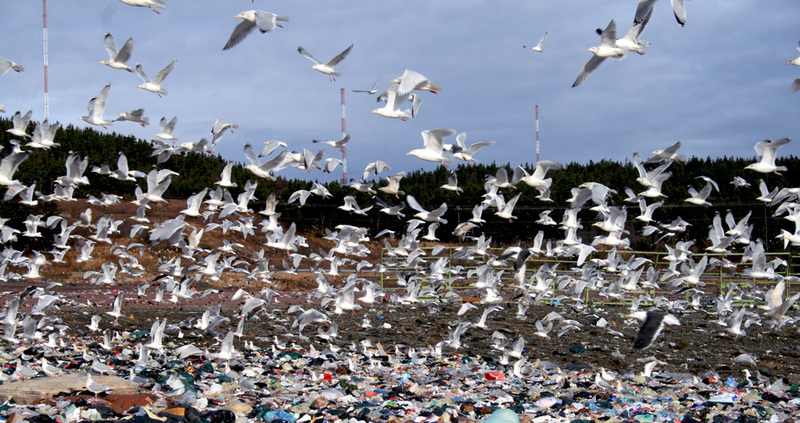 The dump is especially important and very nostalgic for me – bringing back memories of some great gull-watching that I used to enjoy with Bruce almost every Sunday morning in winter. There have been many changes at the St. John’s dump in the past six years, including increased security and inaccessibility to birders. Nowadays, our visits to the dump are limited to just one day a year when the city allows us entry for the CBC. While world-class gull-watching is not limited to the dump (it is in fact available at many locations across the city), it always offered the best opportunities to view large numbers of gulls at very close proximity and was great for photography. 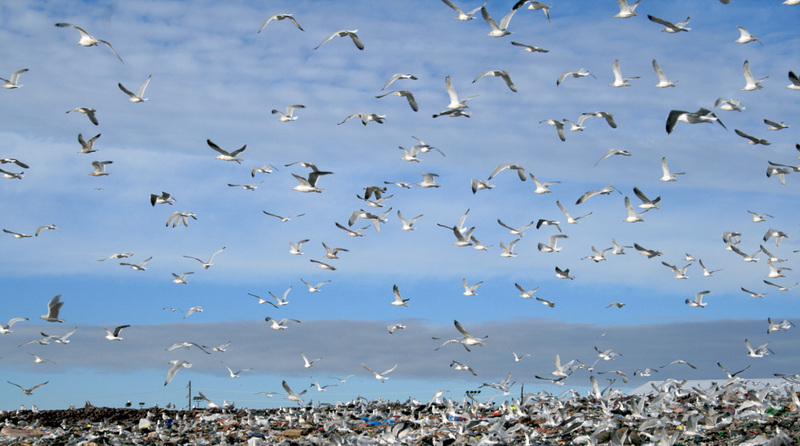 New gull deterrence programs at the dump have resulted in the gulls being much more wary of people and those close-up photography opportunities might be a thing of the past, but the sheer number and great looks at gulls haven’t changed much. We tallied approximately 9000 gulls at the dump alone, the majority of which were Herring Gulls but also included thousands of Great Black-backed Gulls, hundreds of Glaucous Gulls, dozens of “Kumlien’s” Iceland Gulls and nine Lesser Black-backed Gulls, along with a few interesting hybrids. Thousand of Starlings, hundreds of American Crows, a few dozen Common Ravens, several Bald Eagles and two very unexpected Lapland Longspur added to the mix. Unfortunately no real rarities showed up during our three hours of intensive looking. But just being there was a real treat and whets my appetite for the best part of gull season ahead! 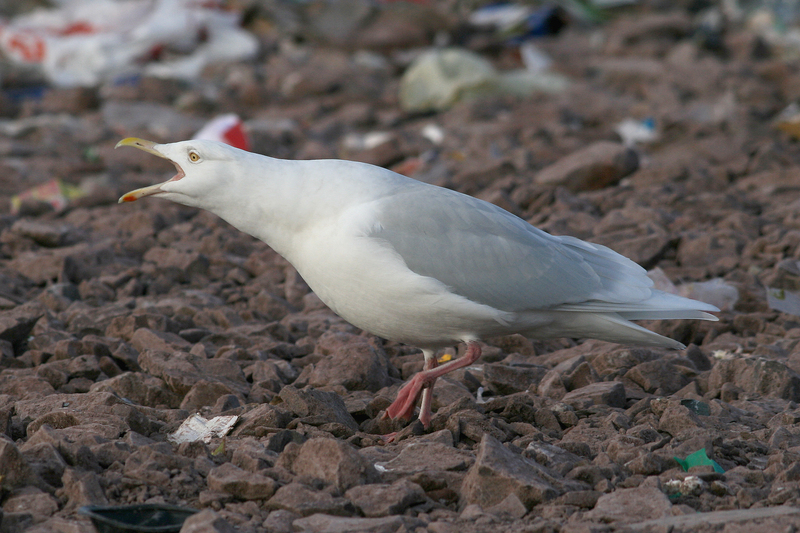 Glaucous Gulls are a sure sign of winter in Newfoundland … even if the weather says different. This adult was photographed at the dump back in the days when we were able to get in more regularly. Moving on to Quidi Vidi Lake and the harbour, we tallied many more of the same species (especially Iceland Gulls, which love our harbour), plus 75 Black-headed Gulls, three Ring-billed Gulls and two Common (European Mew) Gulls. We also tallied plenty of waterfowl, including eight Eurasian Wigeon and six American Wigeon grazing on a golf course, a lone Bufflehead (unusual in the city), two American Coots and the regular crowd of dabbling ducks. With mild weather and plenty of open water, the diving ducks were spread out over other parts of the city. 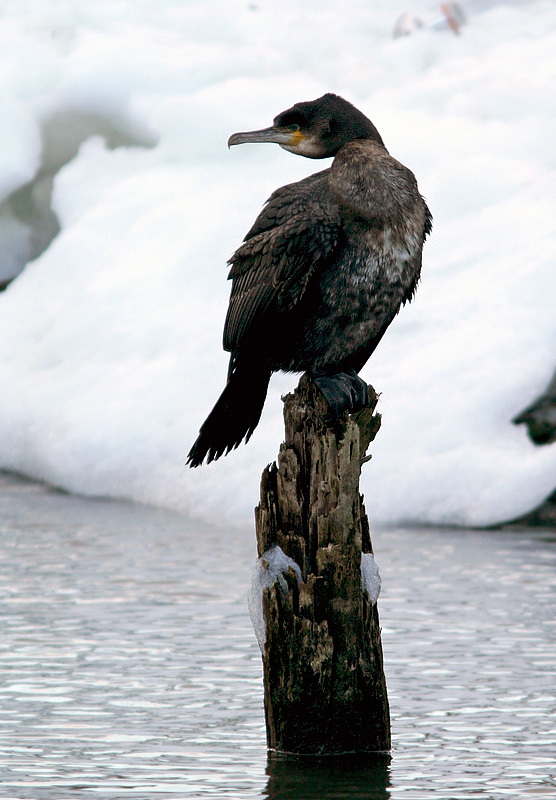 A single Black Guillemot and seven Great Cormorants were also hanging out in the harbour. The complete lack of snow in St. John’s this Christmas is unusual, especially compared to the deep freeze we experienced last December! Our beat turned up nothing but the most expected passerines – Dark-eyed Juncos, American Goldfinch, Boreal & Black-capped Chickadees, a couple Song Sparrows and one Golden-crowned Kinglet. Even a walk in the forested White Hills cam up pretty much empty. Perhaps the weather has been just a little “too nice”, allowing the birds to remain spread out rather than concentrated in areas like ours. Another Christmas, and another Christmas Bird Count, has zipped by. We’ll be spending the rest of the holidays visiting family in Lewisporte – maybe I’ll bump into a good bird or two along the way! This entry was posted in Weather and tagged birds, Christmas Bird Count, Gulls, Newfoundland, St. John's, weather, winter bird list. Bookmark the permalink.